The best part about YouTube.com for this KISStorian is the fact that one can find diamonds in the rough almost weekly like the full live concert vids that seem to keep coming like the mail! 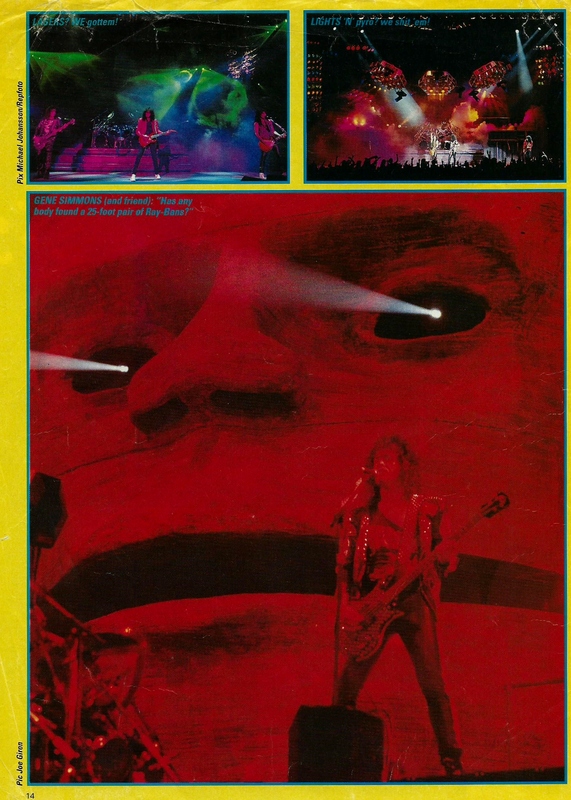 So many great moments on this recent find; a KISStoric Hot In The Shade Tour show from Oklahoma City that finds KISS at their most compelling sans make-up playing their best set list and sounding considerably less frantic than on the prior two tours with Kulick & Carr. 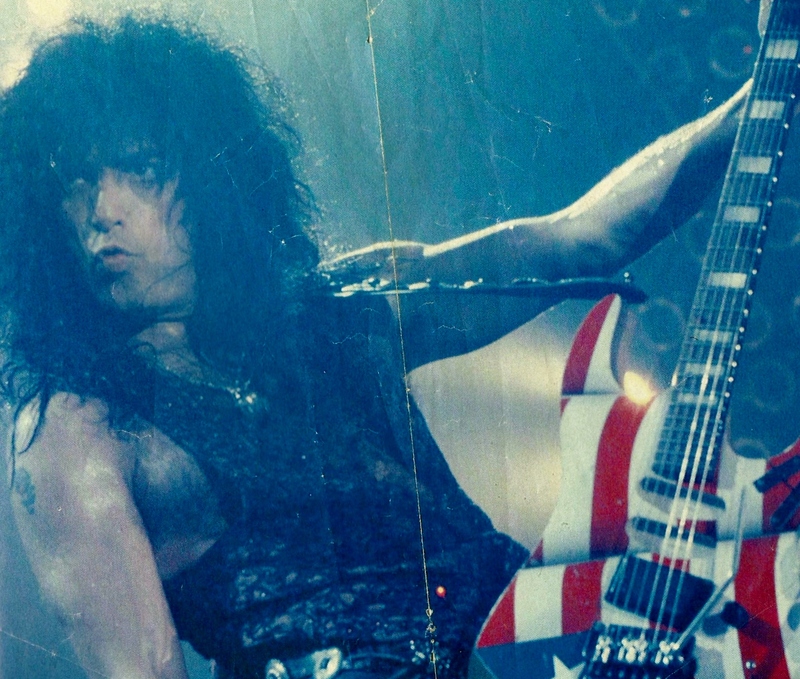 By 1990, the ‘new’ KISS is a seasoned unit, hitting on all cylinders, reclaiming territory. For a hand-held bootleg, the sound is surprisingly warm and not only is Bruce Kulick on fire ‘n tasty throughout, but Gene Simmons is smooth and singing better here than on most of the HITS tour stuff I’ve heard. It also nicely illuminates the bands evolving groove with Eric Carr and their take on semi-shelved KISS classics like “Strutter”, “I Want You” & “I Stole Your Love” with ‘The Fox’ on drums. 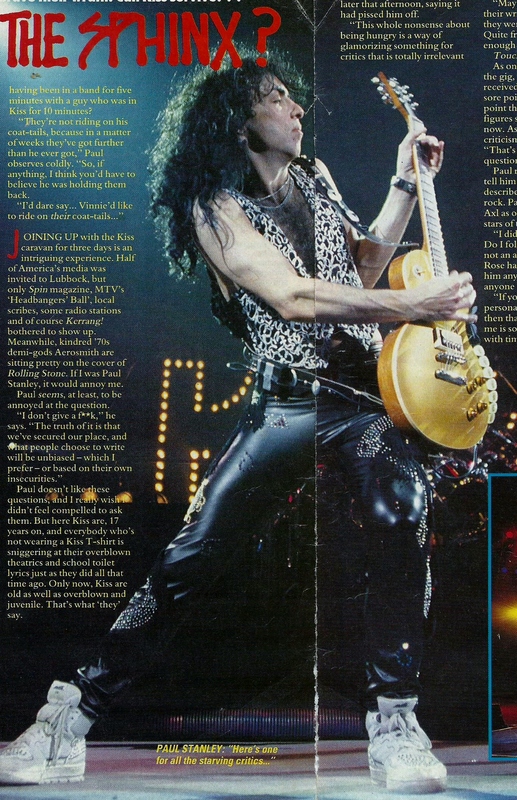 More centrally though, this is our rock & roll party because it captures Paul Stanley at his very finest as a live performer, singer and one of a kind rock star. No one can move while playing guitar like Paul does. He really gives every moment a whole lotta love and can be downright artful at it, bringing a passion, joy and style to the stage rarely if ever achieved by less dedicated artists. KERRANG! Curse of the Sphinx? 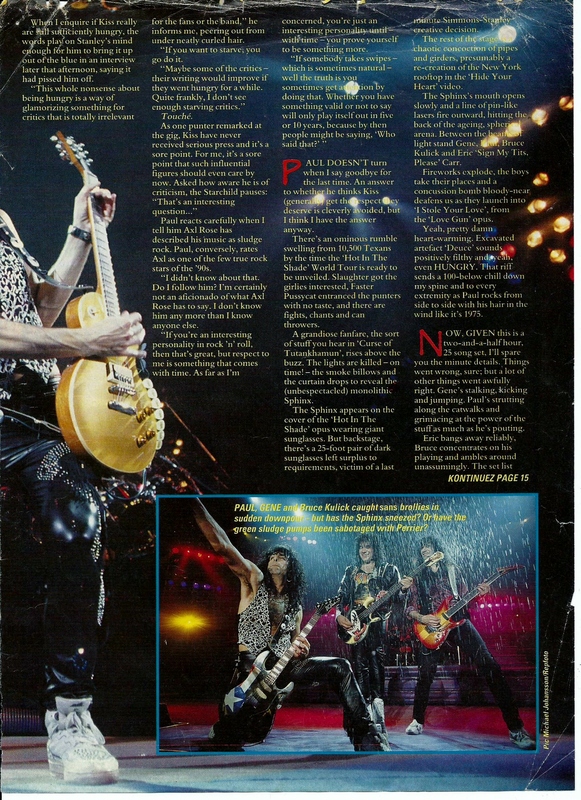 A rather excellent and, as the English say, ‘cheeky’ article from KERRANG about the launch of KISS’s Hot In The Shade Tour in Lubbock, TX. 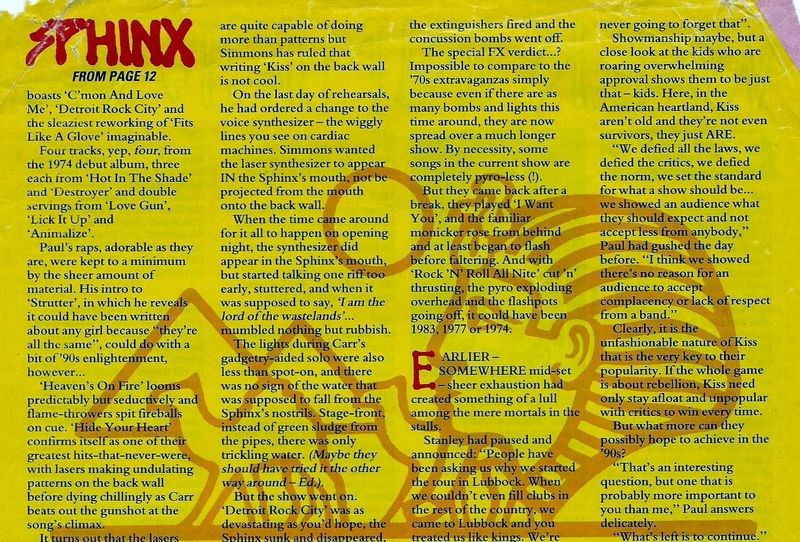 Unless you have a copy of the issue, you missed it … until now when hacks like me can share the work of real journalists who wrote great articles in what were called magazines. KERRANG was hard to get your hands on. You had to travel to the city to get to a real record store that carried some imports. Hope the folks over there don’t mind me sharing this rich slice of KISStory. I was in college at Colgate in upstate New York about an hour south west of Syracuse and I got my buddies Ken & Chris to drive to Rochester, at least two and half hours away, to see Ace Frehley at CrossCurrents (don’t look for it, it’s gone) in Rochester, NY. 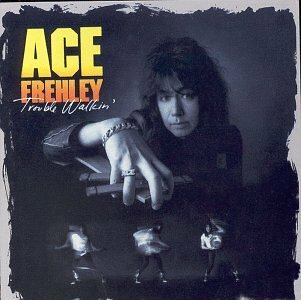 Ace had just released Trouble Walkin‘, a record I was pretty amped about and one that helped define the difference between he and the new KISS who had just released, Hot In The Shade. I was a student DJ at WRCU, 90.1FM, at the time and had contacted MegaForce Records, Ace’s label, to see if I could interview him. As it turns out I talked with now famous rock radio mogul Eddie Trunk from That Metal Show on VH1 Classic who approved a “ten minute in-and-out interview…… time permitting”. I should have read between the lines but was so excited I believed it would happen. It Didn’t. I remember asking Eddie “how’s the tour going?” and all he said, hurried to get off the phone…”yeah man, it’s an abortion”. To be honest, totally green in the industry at the time, I had no idea what he meant. Crazier than that was the dank smell of weed wafting out of Ace’s backstage door upstairs there at CrossCurrents — it could have been Bob Marley’s dressing room! First few rules in A&R broached and observed unwittingly that evening: Play it cool or get bounced and whatever (apparently) the artists wants is how it goes pre-show. I was happy with the near backstage glimpse and brief interaction with what looked to me like hardened criminals / roadies. They were cooler than me to be sure, and a little scary. Ace was in good hands I figured. When we got there they did have my name at the door so I got in for free armed with my small Craig cassette recorder. Pre-show we waited in what was one of these two room rock clubs with a bar room and then the show room which would make for difficult drinking logistics. We would end up in the first row, clinging to the barricade with giant-like 24-once beers that had to last us but, as it turned out, did not. 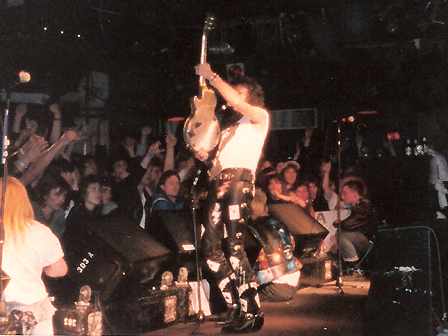 By the time we drank them Ace had not come on just yet and we had to pee so bad we peed in the giant now-empty cups and poured them on the floor which seeped behind the barricade towards the stage. Ace’s roadies had to scurry with big brooms to mop it aside away from the cables and were looking hard at folks when they realized it was urine. They were pissed to say the least but we stayed cool… “wasn’t us, swear to God”. Anyway, before that, I tried a couple of times to go and interview Ace and was sent away. The last time I explained that Eddie had set it all up and asked “So what’s the word? can we do this?” and he replied “The word is Thunderbird…..sorry, not gonna happen tonight pal” and that was it. I had no idea what the reference was but it sounded cool LOL. I don’t recall much about the show besides a broken bottle fight between two chicks that caused the crowd to rear back and the fact that bassist John Regan came out for the encore with like a SRV / Hendrix type cowboy hat with the round silver button things around the brim. I was so buzzed I actually for a split second thought it was SRV and we were gonna have a jam. Ironically, they launched into Ace’s only blues recording “Remember Me” and even my Jimmy Page aficionado friend Kenny was impressed. Ace was on. Sandy Slavin was on drums in place of Anton Fig who played on the record and it was my first time seeing Richie Scarlet in the band and I gotta say he immediately fit great and the Trouble Walkin’ album documents it well. Pity: they should have cut Scarlet’s tune “Animal” but I’ll let that go some day. But for the first time in Ace’s solo career the album felt like his band sounded live — raw and rowdy. Weird how Ace almost ignores the release these days. Someone should pull him aside and remind him playing only half of ‘Trouble Walkin'” (the tune) live is a real disservice. What a fun rock record, worth a revisit KISStorians.